Mom, says it is about time that I give you another update on our activities this year, since you keep me supplied with my favourite Herbal Horse products… Calm Mix and Magnesium Oxide. ? We upgraded to Elementary this year, and have had a good year. Apart from one scary test where we got an all-time low of 49.57% (hey … we finished our test at least, there were 2 retirements that morning over both out tests, so Mom says it wasn’t a total disaster), we have been picking up points in each test. Over the 5 shows we have an average of 58.51% (that low really screws it up!) and the top 6 averages is 60.50%. We have 13 points so qualify to move up again. We have one more show left this year. The goal is to get over 60% in BOTH tests (it’s been the goal all year but has proven elusive). Than after that we have a show gap, and plan to work on all the things we need to go Elementary Medium next year. 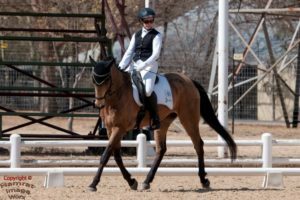 We have also started doing Dressage Anywhere tests again this year. We do the Medium tests on here at the moment, which include trot and canter half passes, which are rather fun! We have our qualifying scores for the Online Championships in November. Am looking forward to that! 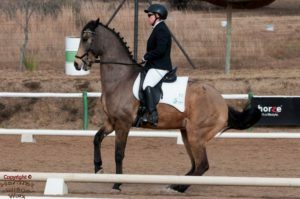 This year Mom signed us up for an online dressage course – Artistic Dressage Beta course with Thomas and Shana Ritter. It was great fun and we learned a lot. The skills we learned on this course, helped us get to the point where I could start learning to do flying changes. These are SO fun! And this last week I figured out how to do them BOTH ways properly! Mom was SO excited for me! Aunty Caroline commented how calm I stay through the changes. How I don’t go running off after ….. it would appear that other horses do, although I am not sure why. Mom stops me and gives me a cookie every time, so no point running off. Can’t wait til we get to do THESE in a test! Mom says that will also be next year – when we move to the British Advanced Medium tests. ? Thank you Aunty Beryl for all my products that keep me healthy : The Calm Mix so I can focus and make Mom proud, the Immune mix so I don’t get sick, and the Rejuven and Digestive for my legs and tummy. Mom says I would be a very pretty paddock ornament without them!